Horse rp. Find a place in your herd, form bonds, fight against rivals and predators. Can you survive the wilderness of Utasia? Or will you fall like the ancestors. Horses, Herds of Utasia :: RolePlay :: Your Bio. Personality: Quicksilver is an aloof individual and lazy. He is charming and easy to get along with. 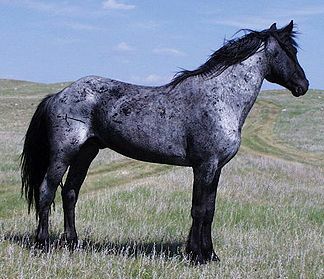 The blue roan is only serious when he is called to be. He loves to run, fastest of his generation. He highly intelligent, and excellent planner. He is playful and kind-hearted. Loyal to his friends and herd. He tends to be very sarcastic and laid back. Weakness: gets distracted easy during a fight. Always trys to put others before him. Not very strong but thats balanced out thanks for his speed and quick thinking. Extra markings (Scares, chip ear, blind..Etc): Long Scare on his hip. History: As a young colt, Quicksilver shown some potential at leadership. But being the lazy type he tried to avoid being noticed by his father, who was the lead stallion at the time. Furious his father forced him to begin lead stallion training angered by quicksilver un motivation to become the lead stallion, since it was a great honor. Through the years he grew and became the Stallion he known for today. Then his father died protecting the herd from a wolf pack attack. Still young Quicksilver took the position quickly taking the lead and ward off the attackers. After that he was the leader ever since. Secrets: Some secrets are better left unsaid.